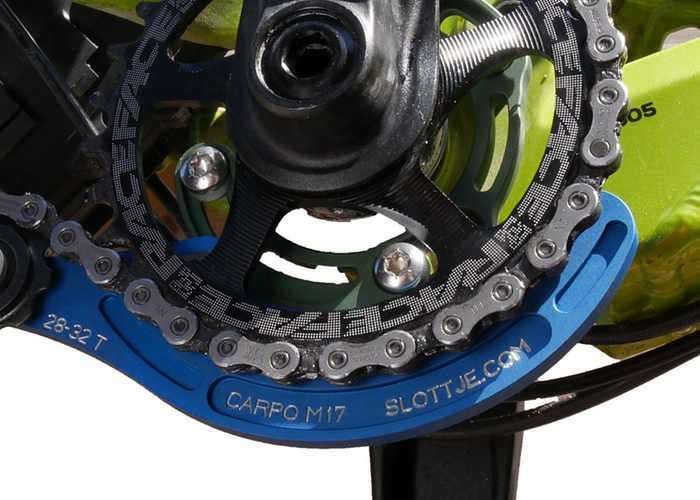 Mountain bikers that enjoy descending mountings at speed, may be interested in a new gadget which has been created by Patrick Slottje which takes the form of a solid chain guide, which has been specifically designed for downhill mountain biking. Watch the demonstration video below to learn more about the Slottje which is taken to Kickstarter this week to raise the €7,500 required to take the design into production. After purchasing my first endure bicycle, a “Canyon Strive”, and testing it France, I experienced multiple times that the chain would get stuck next to the cog-wheel and that it would even break because of a stone stuck in my chain guide. I was able to fix this with some luck and tools, but it caused me to start looking for a solution for this problem. I wanted to provide my bike with a new feature which could prevent this from happening. I researched the problem online, but was unable to find a solution to my liking. Finally, I tried to adapt my bike to the best of my abilities, but in the back of my mind I had the idea to manufacture something myself that would meet my expectations. Everyone wants to enjoy their bike for as long as possible, as they are a substantial investment nowadays. A decent mountain bike easily costs 2000 euro’s these days and therefore you want to protect your mountain bike against damage, even though you take it out for cross country or use it for downhill. While riding, and especially when jumping, the chain will bounce up and down. The chance that the chain will run off the cog-wheel is present. The chain guide eliminates this problem by keeping the chain in the correct position while it passes the cog-wheel. Our vision is that quality is paramount and that it should go hand in hand with a sleek design and a fitting colour. Consumers spend a lot of money to personalize and customize their bike. We want to manufacture a product that is strong and which safeguards the life of a bike and its parts. All our products are made from certified aluminum and high-grade carbon fibers. This in combination with over 40 different colour combinations will enable anyone to put together suitable model that fits any mountain bike.